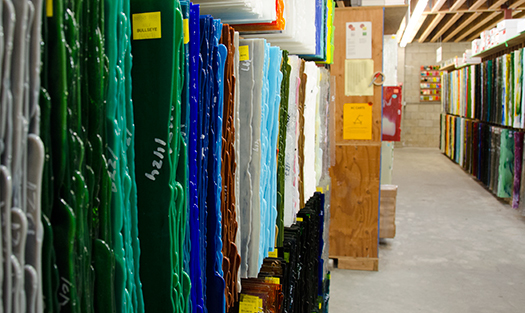 The grading system for our handmade glass demands that each sheet match a target color and have a uniform appearance to receive first-quality grade. Glass that is not quite the target color or that has some other irregularity is graded “Curious” and is sold at a discount. Curious glass that is fusible is graded “Fusible-Curious” and is also sold at a discount. Fusible-Curious sheets are held to the same compatibility requirements as first-quality sheets. Our Curious and Fusible-Curious sheets are excellent for one-of-a-kind projects and are a great value for your dollar. Some of these sheets may be found in the Limited section of our online store. A much wider selection is available when you order by phone or email or when you shop at our Resource Center and some regional dealerships.